Disclaimer: This is a review copy kindly sent to me by Scribe. He had watched for her reaction. Clare had laughed, throwing her head back in a pantomime of enjoyment. Would it annoy him after some time? Would he stop trying to make her laugh? Claire and Andi both connect and are attracted to each other but neither work up the courage to say anything. They go their separate ways but through another chance encounter at a bookstore a few days later, Claire goes home with Andi. The two begin a seemingly normal relationship and both Claire and Andi connect through their mutual disconnection in the world. Claire has left and given up keeping in touch with her friends and family, only sending her mother a few emails here and there to let her know that Claire is alright. Constantly travelling, Claire is searching for something that she cannot define and constantly looking into the distance. Andi lives in an isolated apartment block and have taken away all forms of communication from Claire. Trapped, Claire eventually reforms a rather twisted relationship with Andi who wants nothing but Claire. 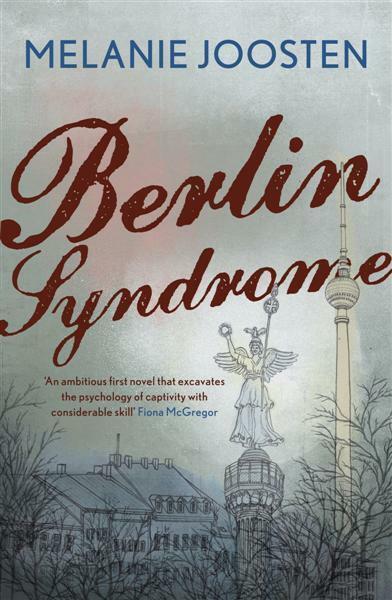 Berlin Syndrome is a really thrilling read and is the debut novel from a Melbourne writer. The prose is sparse but polished and, I found, very elegant. The small, claustrophobic cast was well drawn and in a rather bizarre sense, both Claire and Andi really complemented one another. They were really two lost souls and you felt for their loneliness and disconnectedness. I’m wondering if the title is a play on Stockholm Syndrome? I don’t want to put anybody off but if you liked Room by Emma Donoghue or Before I Go to Sleep by S. J. Watson, then you’ll probably like this too because it’s in a similar vein. I’ve not seen this anywhere and it sounds wonderful. This is the first I have heard of this novel. It sounds like a good story in an enticing setting! Just reading this now, it’s quite creepy when he goes out ‘accidentally’ leaving the door locked!